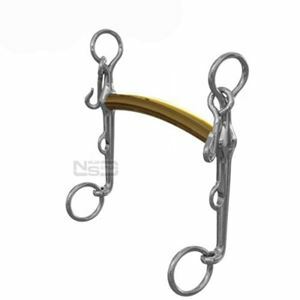 Please Choose Size 4 ¾" 5" 5 ¼" 5 ½" 5 ¾"
The Neue Schule NS Transform Weymouth is ideal for horses that are fussy and overactive in the mouth. Horses that inwardly fixated on the presence of the doubles and not focussing fully on the rein aids often respond brilliantly to the NS Transform Weymouth. The mouthpiece traces out a subtle convex arc which, when the curb rein is employed, rotates the Weymouth cheeks back at approximately 45°. The curb chain is engaged at this point, restricting further rotation and simultaneously the mouthpiece rotates forwards, coming to rest vertically within the mouth. The mouthpiece of the NS Transform Weymouth does not roll forwards onto the thinner more sensitive area of the tongue. The Neue Schule Transform is also beneficial for the “short smile” (small distance from the corner of the lip to the muzzle), as it will sit further back in the mouth. This leaves more room for the bradoon (snaffle part of the double bridle). The comfort this Neue Schule Weymouth often prevents the horse’s need to draw back the tongue, in order to relieve pressure, however if this has already become a confirmed habit, many times exacerbated through tension, it is also physically harder for the horse to achieve this, as there is usually insufficient room remaining behind the Transform.